Coat with Hood - Biker Coat - Button Up Coat half off! We haven't had many cold days here yet. In fact throughout December we have had many days in the 60s, which is very unusual. In January and February I expect things to change and start to be very cold. Have you already been having cold weather? In looking ahead to the cold I have been looking online at new coats. There are just so many options. I have finally decided on black for the color. I feel that black is a a great choice because it is a neutral and I think black tends to look very professional. After all the holiday spending I am also looking for a great deal, so all of the coats above are under $50. I love all of these stylish for less options, but my favorite is probably this classic trench. Which option is your favorite? 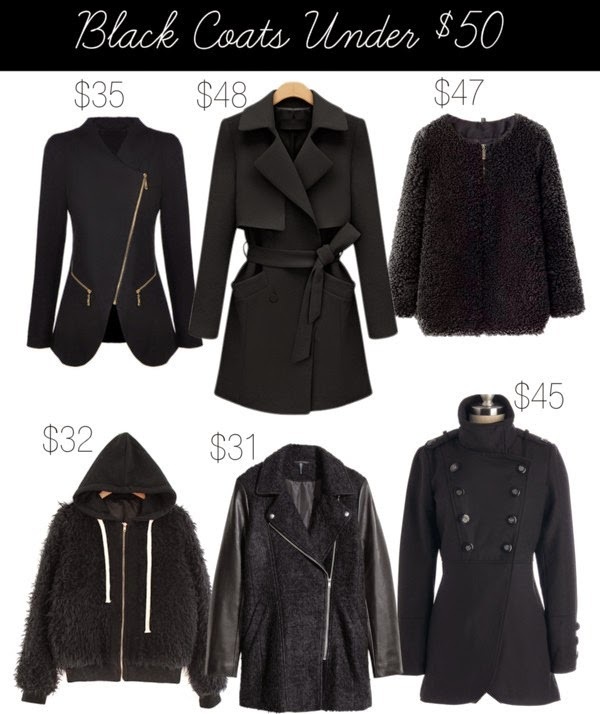 Black coat is always a good idea, I'm in love with the second! These coats are soo cute! I love them and how cheap they are! These coats look so nice and I can't believe the prices on them because usually everything under 50 tends to look like pleather or falls apart. My favorite two are the top left! That is strange it's not colder there, but I'm sure it will happen in Jan. or Feb. :) Brr!! hehe Hope you both had a great NYE.